A man from Preston is wanted by police after a woman was robbed at her home in Fishwick. Stuart Taylor, from Preston, is wanted in connection with a robbery in Samuel Street on January 13. 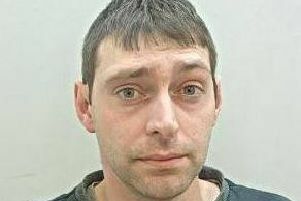 Stuart Taylor, 35, is wanted by police in connection with a robbery in Samuel Street, Preston on January 13. The 35-year-old is alleged to have attacked a woman before stealing her phone. Police are warning people not to approach him, but if you do see Taylor, you should contact police immediately. Taylor is described as white, 6ft tall with a short beard. He has links to Preston, as well as the Trafford area of Greater Manchester. PC John Bantios-Harkin, of Preston Police, said: “Taylor can be violent and is wanted for an offence of robbery. “If you do see him please contact police in the first instance. Anyone with information can contact 101 or email 8091@lancashire.pnn.police.uk quoting log 0936 of January 13.